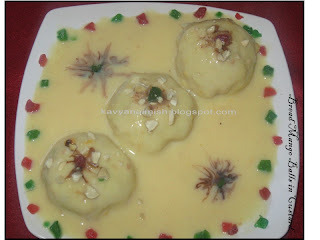 I'm a bifgfan of fruit salad with custard topped with ice-cream and nuts.Today I made this mango Bread Balls in Custard...saw this recipe in one TV show and tried at home to give a small twist to the regular Fruit Salad. Mango..King Of Fruits and Fruit of summer is everybody's favourite fruit.This recipe gives a differnt taste to Mango by having it with custard and slice of bread soaked in milk. 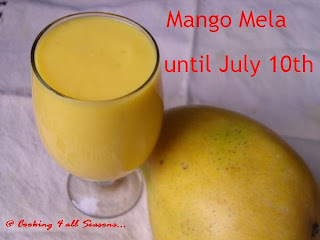 Sending this recipe to Mango Mela at Cooking for All Seasons by SriValli. 1.In a bowl put in cut mango pieces,banana pieces,2 spns of crushed cashew mix well and put aside. 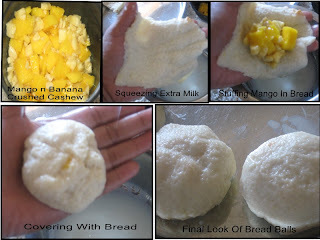 2.Take a cup of milk add sugar to ur taste,dip the bread slices in the milk,put the bread between ur palms and squeeze the excess milk,now put the mango and banana mix in the middle and pull in the edges and made into a round ball and put aside in a plate.Repeat the same with all the bread slices. 3.Cool these bread balls in fridge for 30 mins. 4.Put the rest of milk in a vessel and boil the milk,when the milk comes to boil add the custard powder(add 4 spns of milk to the custard powder before adding it to the milk,this avoids forming lumps) stir well,add sugar to taste and boil it for 6-8 mins,stir continously else it will stick to bottom of vessel.When done turn of the flame and let this custard cool. 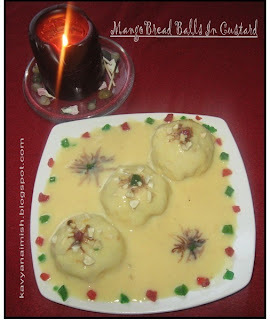 5.After 30 mins the bread balls will be cool and ready to use.Arrange the bread balls in a plate and on top add the custard and finally garnish it with crushed cashew and tooti frooti. Put it in fridge for another 15-20 mins and serve it cool. U can add the topping to your taste.U can add a scoop of ice-cream,honey,whipped cream,cherries,chocolate syrup n etc....Choice of fruits also purely depends on ur taste..
U can add little honey to mango n banana.To enhance the taste of mango I avoided using Honey. Lovely dessert looking at the pic I was deceived that it was rasmalai!!! they look very rich and creamy!!! Wow! thats really wonderful. Love the stuffing & looks yummy. Kavya, all your entries are lovely..thanks!